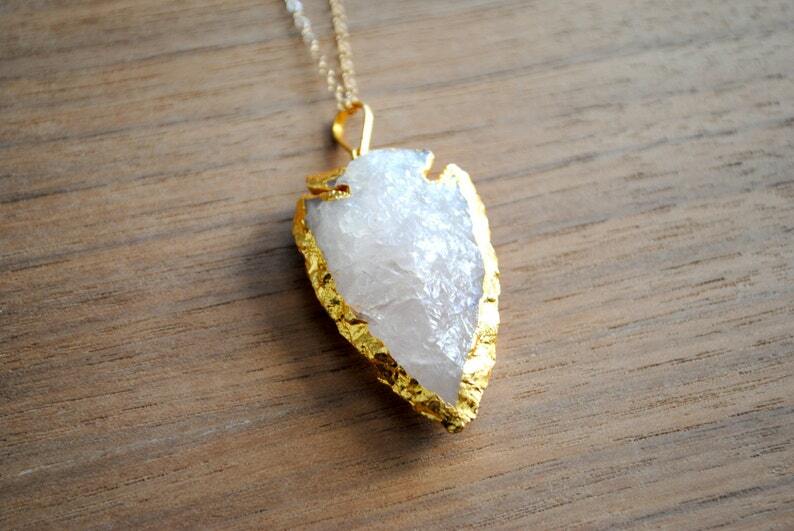 ⊿⊿ This necklace features a beautiful genuine rose crystal quartz in an arrowhead shape that is edged in gold plating. It hangs from a genuine 14 karat gold filled chain - two of the pendants are 18" in length and the other two are 30" in length. The necklace closes with a spring ring. No extender is available and this is the only lengths the necklaces come in. ⊿⊿ The pendants are about 1 1/2" in length and 1" in width and each is unique and one of a kind and will feature natural variations/cracks/fissures/imperfections - all organic to the raw cut of the stone. ⊿⊿ This particular quartz is a rose quartz, but these stones appear much more frosted white with only the slightest hint of a light, light rose (actual color will vary from the colors on your screen). ⊿⊿ Rose quartz is known for many metaphysical properties, such as lowering stress and tension in the heart. A great way to cleanse your stone in order to promote positive energy is to burn sage and let the smoke pass over your stone. You can also recharge your stone by leaving it in the sunlight for about four hours.